Dental implants are an option for patients who are missing permanent teeth. 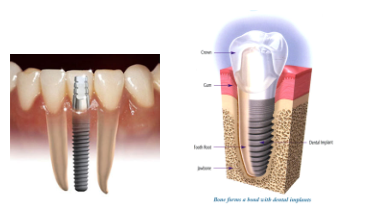 Rather than resting on the gum line like removable dentures, or using adjacent teeth as anchors like fixed bridges, dental implants are long-term replacements that are surgically placed in the jawbone. Composed of titanium (metal) or zirconia (nonmetal) that “fuses” with the jawbone through a process called “osseointegration”. Dental implants never slip or make embarrassing noises that advertise the fact that you have “false teeth,” and never decay like teeth anchoring fixed bridges. Because dental implants fuse with the jawbone, bone loss is generally not a problem. After more than 20 years of service, the vast majority of dental implants first placed in the United States continue to still function at peak performance. If properly cared for, dental implants can last a lifetime.